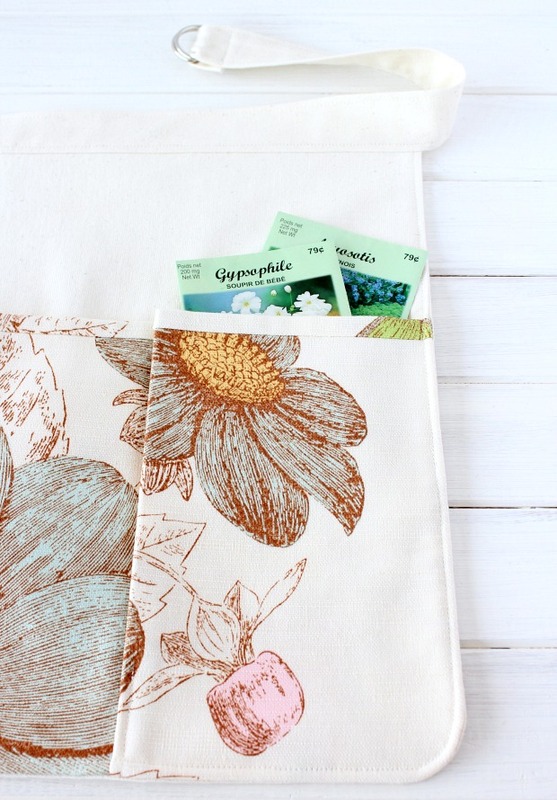 Sew your own gardening apron with handy pockets for keeping tools and supplies at your fingertips while protecting your clothes! Hello everyone. Today’s an exciting day as we’re kicking off this year’s OUTDOOR EXTRAVAGANZA! I can’t believe this is the 5th year for this series already. That’s a whole lot of outdoor projects! If you haven’t started working on your outdoor space, now’s the time! 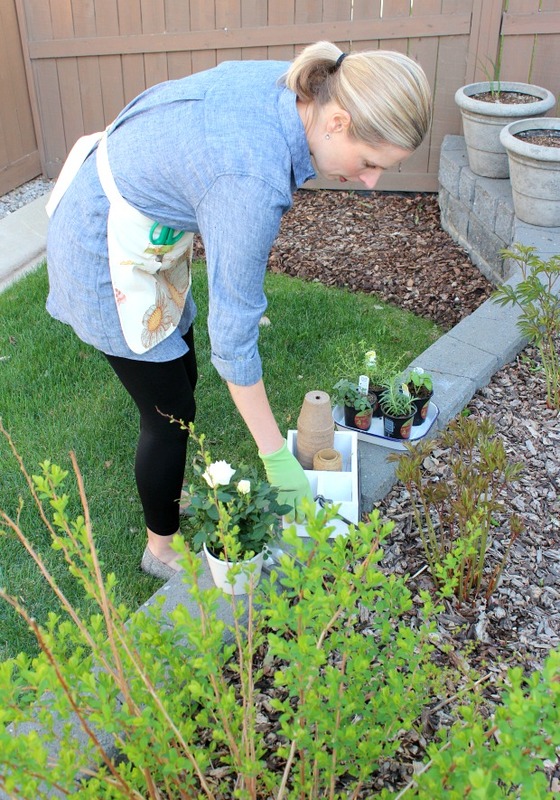 I promise you’ll be inspired to do some gardening, entertaining, lounging and more. As in the past, I’ve invited a few of my creative blogger friends to join me. Over the next few Thursdays, we’ll be sharing our Plants & Flowers projects, Outdoor Decorating & Entertaining ideas, as well as Build-it & Paint projects. Then, on May 27th, we invite you to come back for one big OUTDOOR EXTRAVAGANZA link party, where you can share your own outdoor projects and discover something new! A gardening apron is something I’ve wanted to make for a while now. Having a small back yard, we don’t have room for a potting bench or a gardening shed, so I tend to scatter my tools all over the place as I work. It’s pretty annoying. Last May, I made a handy garden tool storage box, but having an apron that keeps garden snips, string, gloves, seed packets, and other gardening supplies at my finger tips is a time (and back) saver. Plus, wearing a gardening apron means my clothes will stay clean(er) as I work. When it’s dirty, I’ll simply empty out the pockets and put it through the washer and dryer. Easy peasy! You may want to choose a darker fabric if you’re doing some heavy duty gardening. I wouldn’t dare wear this one at my parents’ farm! 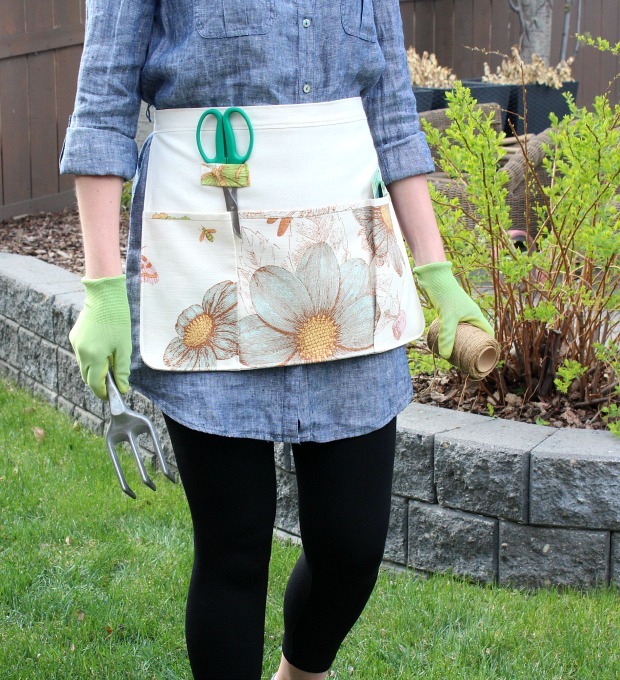 This gardening apron is fairly easy to sew (I’d say intermediate level). I was able to finish mine in an afternoon. One size fits most (I’m fairly tall and wear a medium in most clothing for reference). The tie is adjustable at the back so you can wear it at a height that’s comfortable. Note: Medium weight cotton canvas works well for this project. Preshrink fabric in the washer and dryer ahead of time. Press if wrinkled before using. Scrap fabric will work for this project too. Play around with pattern placement. Note: All seam allowances are ¼” unless otherwise noted. Match the upper edge of the pocket and pocket lining with right sides together. Sew across the top. Press the seam allowances toward the lining. Flip the lining to the pocket wrong side, matching the lining and pocket lower edges (the lining will extend above the pocket to form a trim). Press in place. Baste the sides and lower edges together. Mark the lower center on the apron front and the pocket. Place the pocket over the apron right sides up and baste the ends together. Match the centers along the lower edges and baste a 2″ line across to hold it in place. Note: the pocket is wider than the apron front. Measure 6.75″ in from each side and mark a parallel line through the height of the pocket. Stitch along the lines, backstitching at the top for extra reinforcement. Fold a pleat in the pocket along the stitched vertical line so the pocket lays flat against the apron (toward the center). Press firmly and baste the lower edge to hold in place. Stitch a 2″ vertical line from the lower edge, backstitching at the top. Using a chalk pen, sketch a slight curved line on one of the bottom corners to round it out. Cut off the bottom portion. Fold the apron in half and cut the other side to match. Lay the apron over the lining piece right sides together (matching all raw edges) and cut the corners to match. Pin together and sew all around except for the top portion. Trim and notch the corners and turn the apron right side out through the opening at the top. Press the seam edges all around, then baste the top portion to close it off. Top stitch remaining edges. With right sides together, place tie along upper apron edge. Pin in place with 9.5″ of tie length extending to the right side of the apron edge. Stitch in place along the entire apron top. Press seams toward tie. Fold tie right sides together, matching ends and long sides. Pin and stitch starting at one end, pivoting at corner and stopping 3″ in (towards apron). Repeat on other side. Trim corner and seams, and turn right side out. Press tie edges together, folding raw edges under beyond the stitched portion. Continue along entire tie length, sandwiching apron between the tie in the middle portion and pinning in place. Top stitch around entire tie perimeter making sure to secure the middle section to the apron along the inside edge (catching the underside of the tie along the apron as you go). Attach D rings to the short side of the tie by sliding both on together (facing up) and looping the end around to match up with the back of the tie (about 1″ in). Stitch in place. With right sides together, fold loop rectangle in half lengthwise and stitch together leaving ends open. Turn right sides out and press with seam at middle back. Stitch close to the end of each raw edge to finish it off and trim any loose threads. 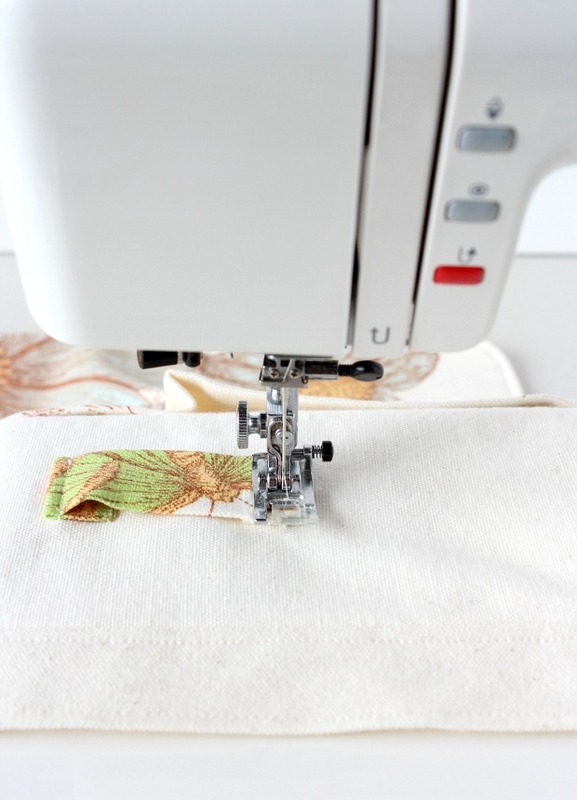 Turn ½” under on each side and fasten with a line of stitching above pocket (allowing slight slack in the loop to hold scissors). Note: attach to right or left side of the apron depending on preference (i.e. right or left-handed) and at a height that’s comfortable. 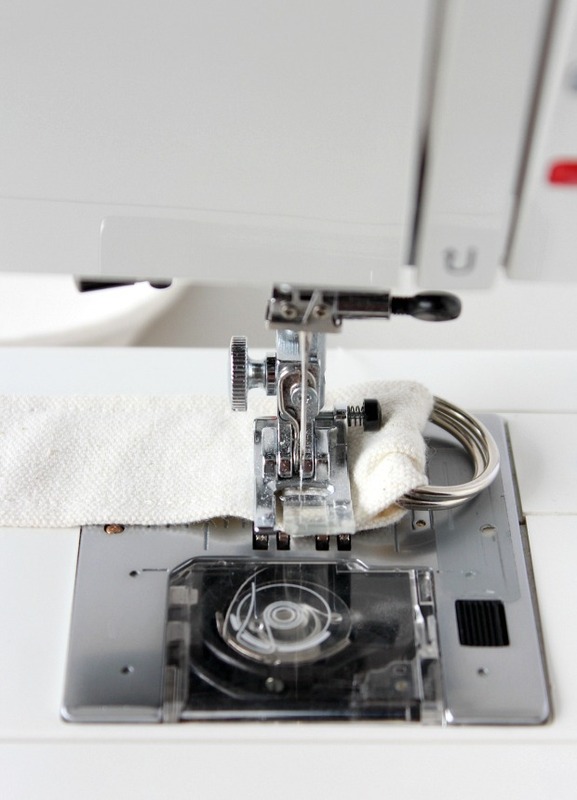 Clip any loose threads and give one last good pressing with the iron. All done! 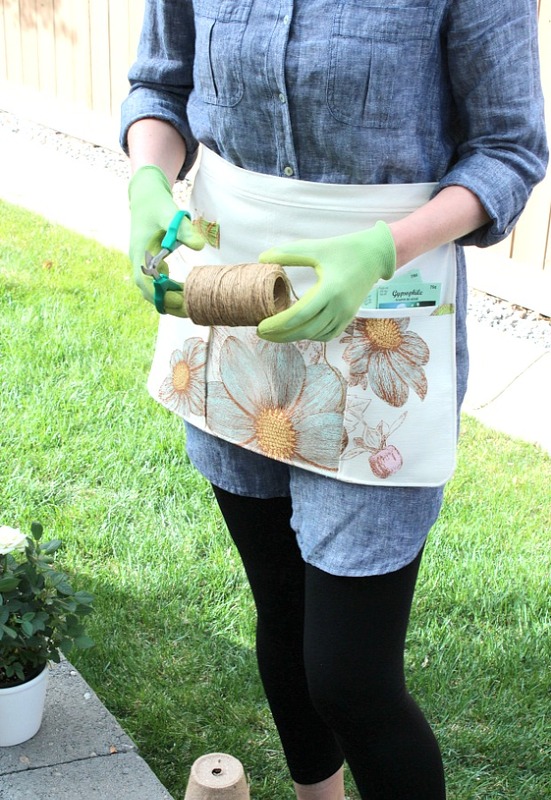 This utility apron also makes a great gift for the gardener or crafter in your life. Be sure to fill the pockets with supplies for even more fun! Perfect for Mother’s Day too. 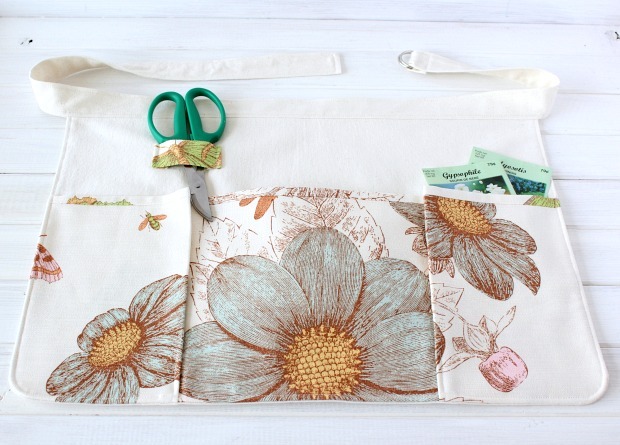 Going to make your own cute gardening apron? 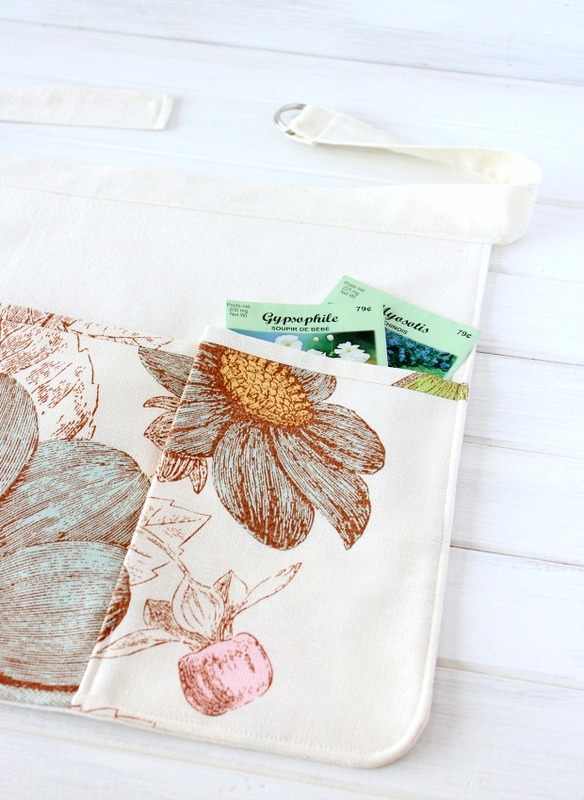 PIN THIS DIY GARDENING APRON PROJECT! Ready to take a look at the other Plants & Flowers projects? 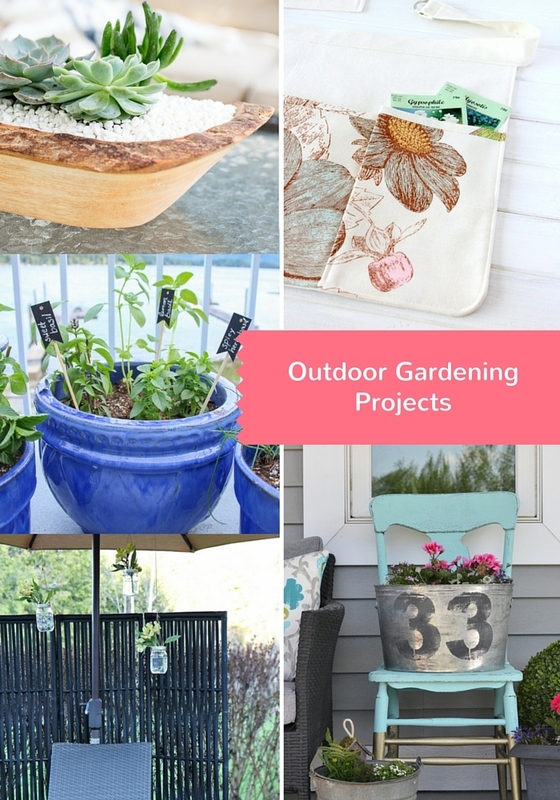 Some of my blogging friends joined me to create and share more outdoor gardening ideas. Stop by and say “hello” (we love comments and shares)! Be sure to come back next Thursday to check out our Outdoor Decorating & Entertaining projects. As well, mark your calendars for the Outdoor Extravaganza link party on Friday, May 27th! 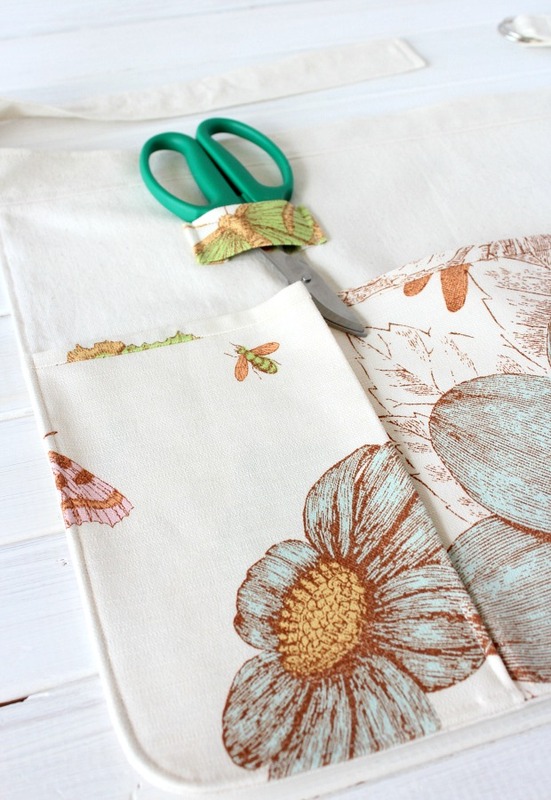 I love your apron pattern and fabric choices Shauna – gorgeous! 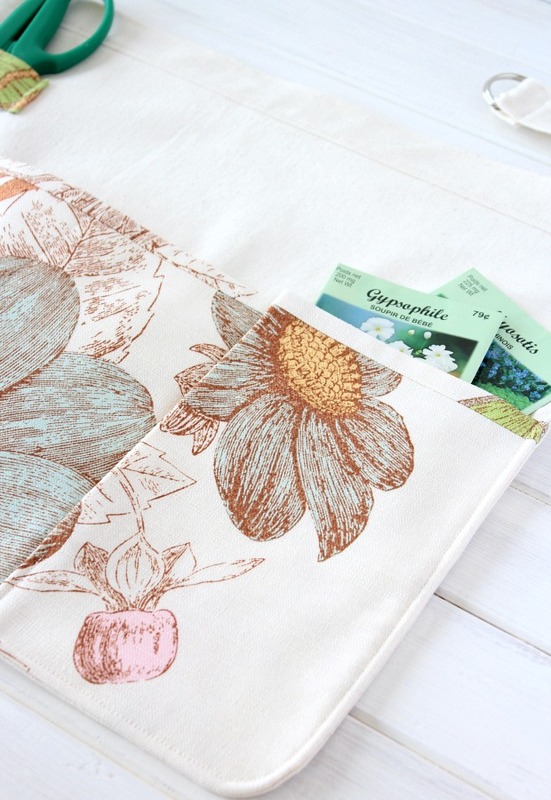 Perfect for gardening and gifting! You are a beautiful sewer – thanks for sharing the instructions and hopefully we’ll get some nice weather soon to enjoy the outdoors! Thank you, Heather! Looks like I’m going to get to use it this week- so beautiful outside. Thanks, Krista! I’ve had my fair share of sewing practice over the years. 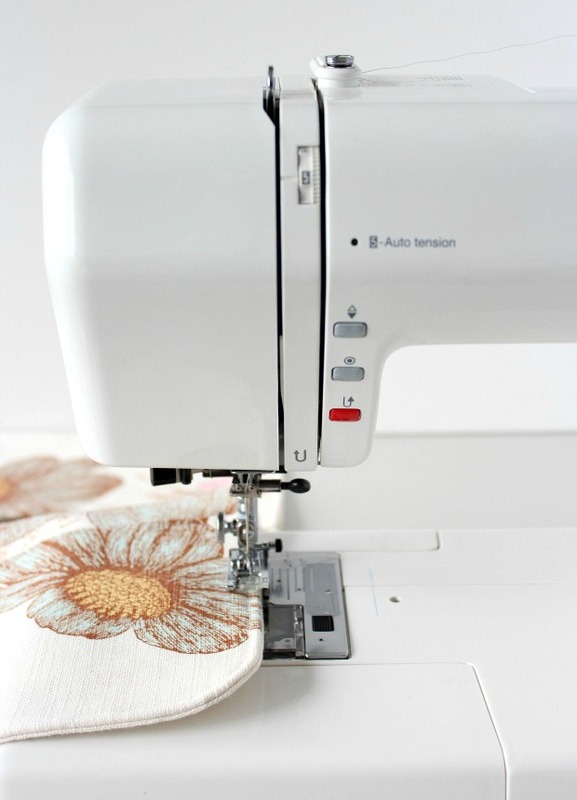 It had been a while since I pulled out my sewing machine, but it’s kinda like riding a bike. Now I need to sew seat cushions for my new dining chairs. That could be a little more challenging! This apron is too cute! Just wish I had a green thumb to go with it. :P Thanks so much for linking up with us! Hi Kelly, Thanks for stopping by and checking it out! Hi Amber, Than you! I’m waiting for your next go-around and I’ll hopefully be able to join in again.